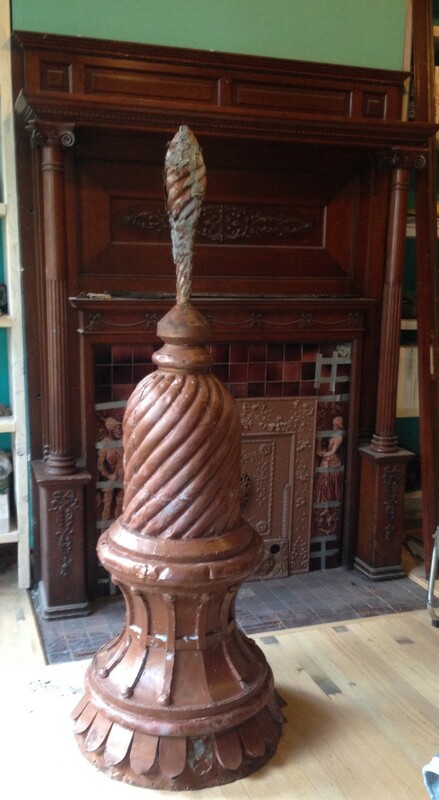 I have done a number of posts about the finial to the turret of the Cross House. 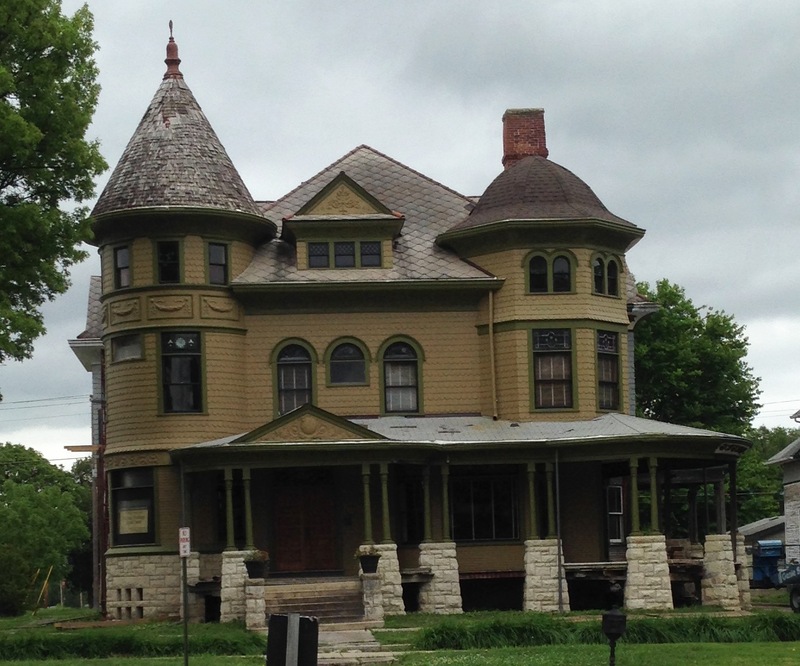 For 122-years it was a dramatic punctuation mark atop the pointy roof. 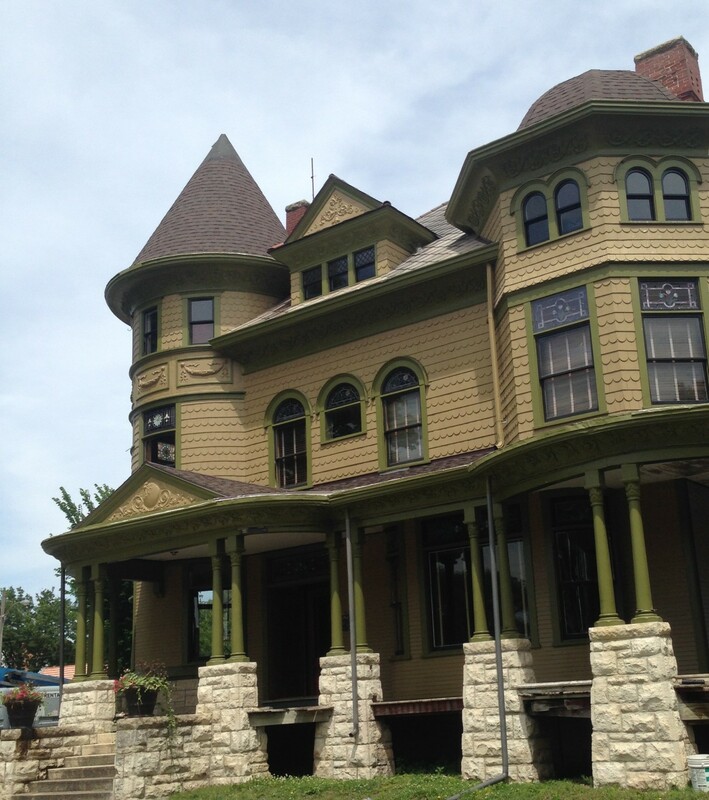 For 122-years it endured rain and sleet and storms and heat and hail and birds pooping on it. And after 122-years, it needed some attention. 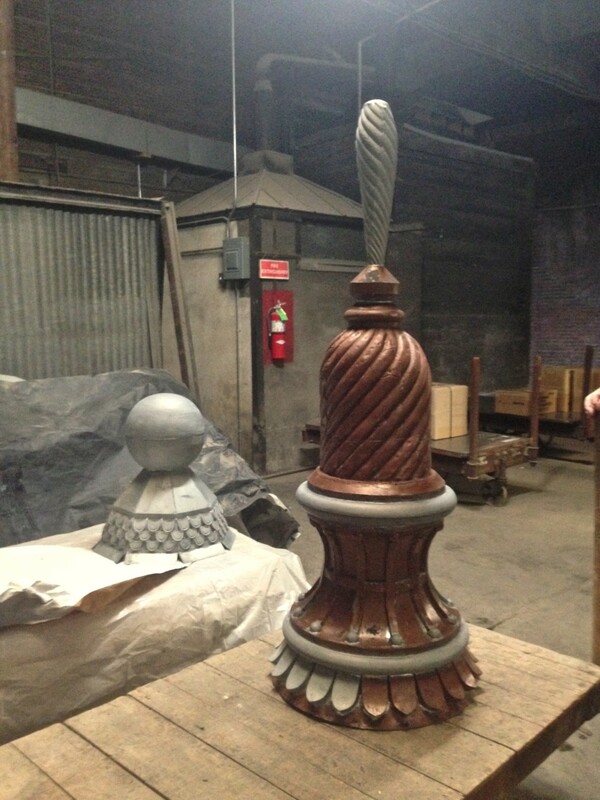 So, the finial was removed when the turret roof was redone, and brought into the library. It was both better than expected, and worse. I could have just painted it, and had it reinstalled. The numerous issues and missing bits are hard to see four stories in the air. But I couldn’t. The turret roof roof looked naked without its finial. The octagon tower originally had a finial, too. But this was long gone. Today, I did another road trip (road trip!) back to W. F. Norman. 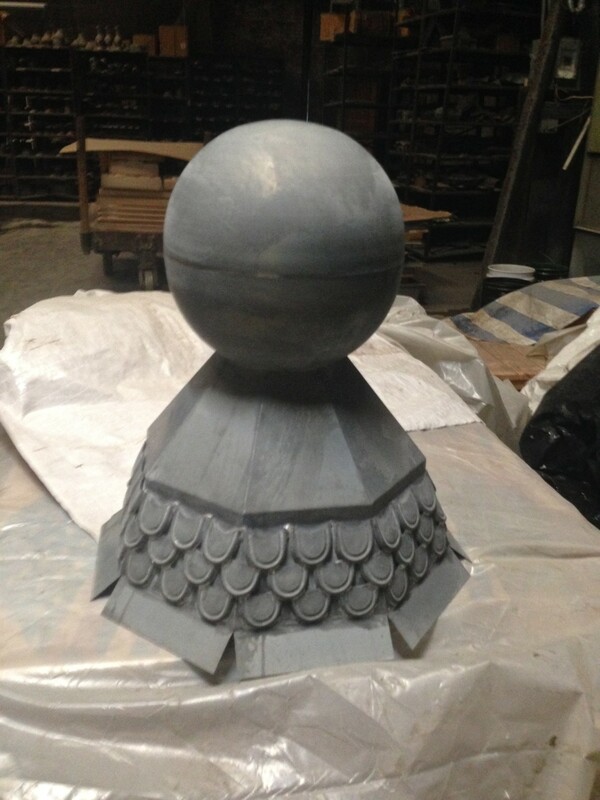 They had renewed the turret finial, and (drum roll, please) recreated the long-lost octagon tower finial. I could now bring my babies home. EEEEEEEEEEEEEEEEK! incredible! I am FREAKING out! The TALL turret finial has been renewed for another century (all the gray parts are new), and look at its new sibling to the left!!!!!!!! So, from a single image, W. F. Norman was able to create this!!!!!!!! I LOVE IT! 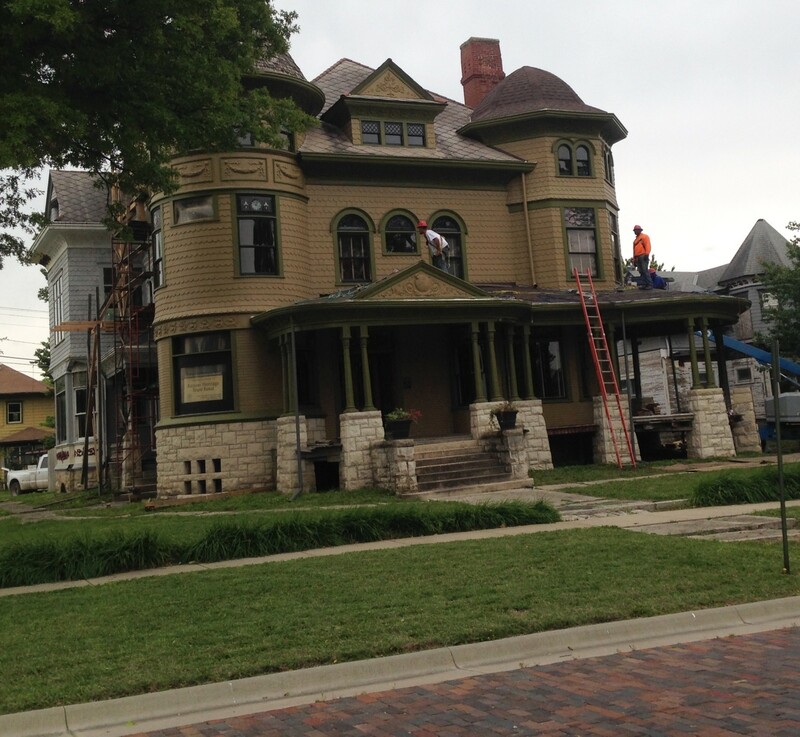 This weekend I will prime and paint the finials, and hopefully can get them reinstalled next week!!!!!!!! I will then place a chair on the sidewalk across the street, and spend days staring at my beautiful babies, with a broad smile of delight. 13 Responses to I AM SOOOOOOOO EXCITED!!!!!!!! Good work on the finials. Glad you could get the second one made. 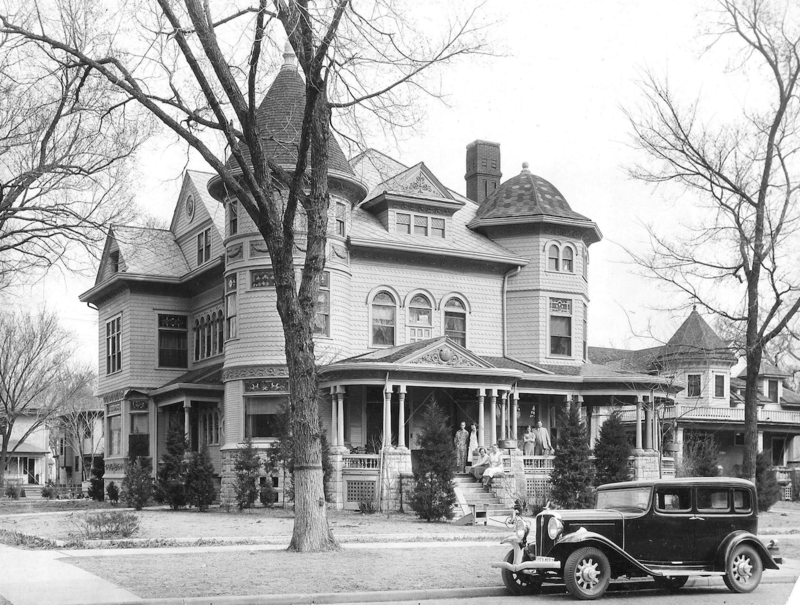 Great old picture of the house. What is the flat thing lying on the porch roof? And what are those two “lines” coming from the porch ceiling out to either side? The flat thing on the porch roof? I am guessing a temporary repair. The two lines? I am guessing wire to guide vines. What color(s?) do you plan on painting them? The same dark olive green as all the trim. Totally fabulous. I dream of having recreating our long lost finial too. One question… how will you get them put in place? You sound like a proud papa indeed – and rightfully so. They look great! I was handing out cigars all day! I think you should have a small one made and wear it as a hat. Stunningly beautiful! Ross how do you find such wonderfully gifted craftspeople? The Cross House couldn’t have found a better owner. Your babies are beautiful!!! I see you sitting across the street in a circa 1950s lawn chair early in the morning with a great cup of coffee, sunny day and sunglasses…..all the better to see “the babies”!